Robert Grossman, the cartoonist, caricaturist, illustrator, sculptor, animator, and commentator, who died on March 15, will be much missed, but his unforgettable images will live on. I had the honor of publishing Bob, then fresh from Yale, in Monocle, the political-satire magazine I had founded—with the help of Richard Lingeman, among others—while at Yale Law School. Way back in the early 1960s, Bob gave us one of the first black superheroes, Captain Melanin, along with Roger Ruthless of the CIA; with the latter, he did as much to question the agency’s work at that time as any print journalist. As art director Steven Heller wrote some years ago, “These strips acerbically address issues of the day, most often before they are on the popular culture radar screen.” Grossman also gave us Richard M. Nightcrawler—almost as wormy as the real Nixon, with two henchmen named Haldebug and Ehrlichbug. 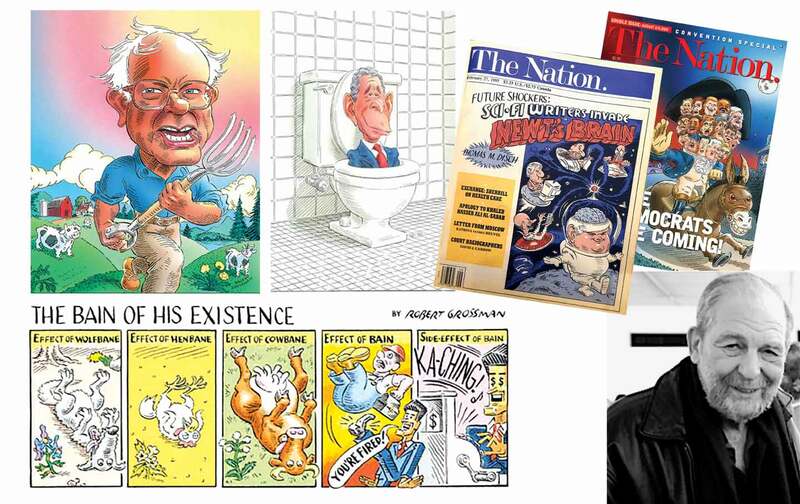 Grossman’s cover art, spot illustrations, and comic strips (such as the Stone Age–themed ”The Klintstones,” a running gag during the Clinton presidency) have delighted readers of The Nation for many years.